In Fishing with Granpa by Rebecca Hummel Kenyon, a young boy recounts delightful memories when he spent time with his grandfather. They had enjoyed fishing together and having conversations during their outings. His grandfather had talked about his younger days and they had discussed their fears and hopes with each other. Those were beautiful days. Now, his grandfather cannot go fishing with him. He gets tired and confused especially when having conversations. At times, he is unable to differentiate people. The boy looks sadly as his grandfather fades away. He is further saddened by the fact that he does not know what to do to bring his grandfather back. All he can do now is sit and spend time with him, even when his grandfather does not remember who he is. Rebecca Hummel Kenyon’s enlightening book, Fishing with Granpa, is an informative read that explains the effects of Alzheimer's disease to young children. Like the boy in the book, they may feel confused about what is happening to a person close to them who has the disease. Through the story, they will learn the symptoms of the disease and how it affects patients. The illustrations are colorful and creative and the story is centered on the relationship between the boy and his grandfather which shows their bond. It is also told in the first person and this helps adults reading the book to view a similar situation from a child’s perspective. Fishing with Granpa is well-written, engaging and an eye-opening read for both young and adult readers. Fishing with Granpa: A Children’s Story About Alzheimer’s is an educational children’s storybook written by Rebecca Hummel Kenyon. Those fishing trips were the highlight of their lives, both the grandpa and his grandson. They’d get up early and walk through the fog to the dock where their little boat was waiting. They had a special place on the lake that they knew would be peaceful and calm -- and filled with the fish they’d be bringing home later that day. Both of them loved watching the rods and waiting for the dip and bobbing motion that would mean they had a fish on the line. Granpa had cool stories about the giant fish that got away, and his grandson was already compiling the fish tales in his own mind he’d be sharing someday. Sometimes they’d talk about sports, especially baseball, their favorite, and the Cubs. At the day’s end, they’d head back with the day’s memories fresh in their minds and a pail filled with their catch. Sometimes, though, Granpa acted a bit disoriented and was very tired when they got home. Then, this summer, there was to be no more fishing. Granpa doesn’t always remember what’s going on or even who his grandson is. Sometimes he calls him by his father’s name, and sometimes he seems angry and frustrated by what is happening to him. But then, still, there are the magical moments that mean so much. Rebecca Hummel Kenyon’s moving tale looks at the relationship between a grandson and his grandfather from one summer to the next as his grandfather’s Alzheimer’s progresses. The magic of the fishing trips the two shared for so many years was the big takeaway here for me. Kenyon makes that lake seem alive, and you can almost hear the water flowing past their little boat as they wait for those fish and shoot the breeze. Alzheimer’s is hard for adults to understand; it’s even harder on children who suddenly seem to have lost one of the great stabilizing figures in their lives. Rebecca Hummel Kenyon’s story helps kids understand what’s happening with their own gram or gramps, and it teaches them to treasure their own favorite memories and hold them close. And while gram or gramps doesn’t always seem to be there, there may still be a magical moment waiting for them to share as well. Fishing with Granpa: A Children’s Story About Alzheimer’s is highly recommended. 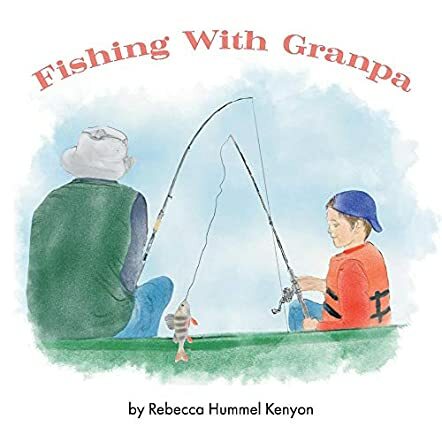 Fishing with Granpa by Rebecca Hummel Kenyon is a wonderful way to prepare young children for the changes they see and sense in their aging grandparents, especially in this story as a result of Alzheimer’s disease. Even adult children struggle with the physical and mental breakdown they see in their parents, but as adults, if we are aware, informed and care, we are somewhat better prepared to cope with our parents’ forgetfulness, ramblings and irritability. But those same issues can be utterly frightening to a youngster whose knowledge and love of a grandparent is based on spending good times doing things together, as in this book; fishing, learning each other’s likes and dislikes and watching sports games. Then one day, or bit by bit, the grandparent changes. How do you explain to a child what is happening? Or prepare them for the fact that perhaps, in the not so distant future, that grandparent will no longer be here? Fishing with Granpa is a wonderful way for your child to learn and understand what is, and will happen. The illustrations in this book are colorful but uncluttered. The printing is smaller than one usually finds in children’s books but it keeps the book looking clean and is in line with the seriousness of the subject. The story is told through well-done rhyming couplets. The theme and message behind Fishing with Granpa will be appreciated by parents and teachers while children will love the story. An important addition to any children’s book collection. Having to watch grandparents go through this is hard, I love how this story gives facts in a story that is relatable to kids.